If you have studied Biblical Greek, you know that even after two or three semesters in the classroom it can be easy to soon forget most of what you learned, especially vocabulary. After entering the working world, most of us who studied Greek in seminary or college find it challenging to pay much attention to the language, let alone achieve our primary goals of exegeting and meditating on God s Word in the original Greek. 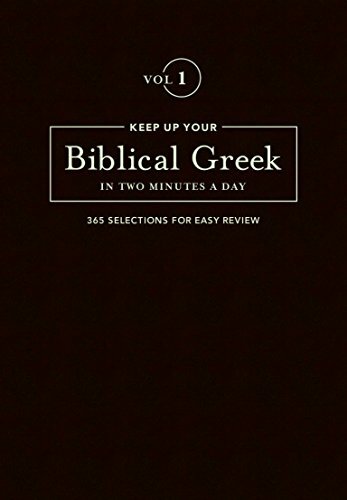 Keep Up Your Biblical Greek in Two Minutes a Day: Volume 1 is designed to help you reconnect with Greek in an easy and enriching way and to empower you with the vocabulary you need to begin again reading the New Testament in its original language. View More In Language Studies. By Brand: Sovereign Grace Publishers, Inc.